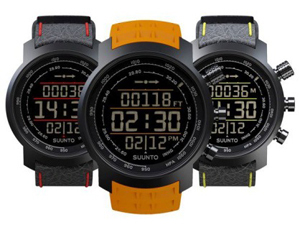 The classic Suunto Elementum, top line of the Finnish brand expanding its borders by acquiring new space, thanks to its lightweight image from introduction of small but significant details that make it more attractive and likeable. Devices that designer Vantaa have made and which, according to their judgment, infonderebbero a touch of color and sprint to a product known to elegant and austere. Three models that come overwhelmingly from the front door and through the red and yellow colored notes juxtaposed with the classic black show a non-marginal change that leads to judge otherwise, does not change the image that preserves but give yourself a nice change of dress. An informal look destined to reap support among younger audiences, careful to observe the slightest variation and introduction. Still remains an excellent wrist computer with quality above average; features a linear design, which uses essential materials such as stainless steel case and sapphire crystal glass, perfect for outdoor activities, thanks to the different functions that take full advantage of the advanced digital technology that necessary change to be worn as a stylish watch to wear every day. To the solid stainless steel bracelet is proposed a fine leather strap with stitching that greatly lighten; now the presence of a silicon strap amber, from which the name Amber, Brand decidedly the visual impact of the clock decomposing further its known image. Traces of amber are also visible on the dial-graphics display, these changes did not just confuse the ideas of those who observe them, forcing to pay close attention to the aesthetics of the watch. In April will be available alongside the other models known and appreciated. A wider choice that the public will have. This is still a very good perfect for any outdoor excursion, full support to accompany you and help you during your trips outdoors.